X’s vs. O’s: The eternal struggle! For centuries, Tic-tac-toe was a game limited to one tiny grid of nine squares, devoid of strategy and filled with draws. Prepare to say goodbye to pen and paper simplicity, and say hello to TAC! The rules are familiar, but with an imaginative twist! This classic puzzle has been expanded and reimagined into a unique and epic variation on an all-ages favorite! But you don’t! TAC is played on a huge 3x3 grid called the Big Board. Each of the nine squares are actually tic-tac-toe games of their own. The gameplay in each of these squares, called the Little Boards, is familiar. Players take turns placing either X’s or O’s in an effort to attain three in a row. Every turn is a strategic dance. Each placement you make on the Little Board determines which square your opponent gets to move to on the Big Board. 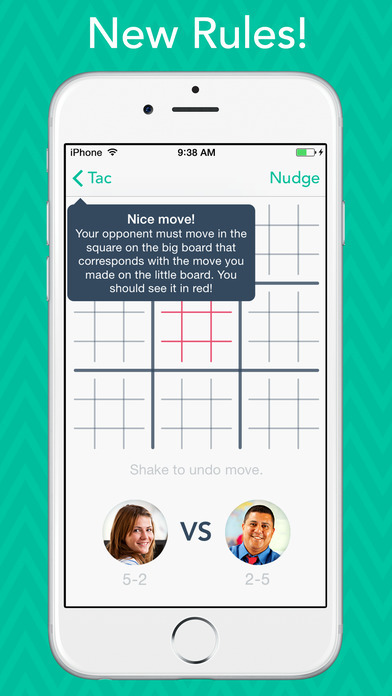 You can either gain advantage on the Little Board or force your opponent to play in a certain square. Move wisely! 1) Score three in a row on the Big Board! If you win on a little board, it’s like selecting a square on the big board. If you succeed in lining up a trio of wins on the big board, you win! 2) Dominate the big board! If you earn more squares on the big board than your opponent, you win! 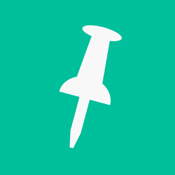 Challenge your Facebook buddies or square off against strangers. Take on an AI opponent and perfect your strategy. Make a mistake? Redo your last move and get back on the winning path! Use the in-game messaging feature to compare your record with friends, or just to send a friendly message! Track your wins and losses while earning Game Center achievements. 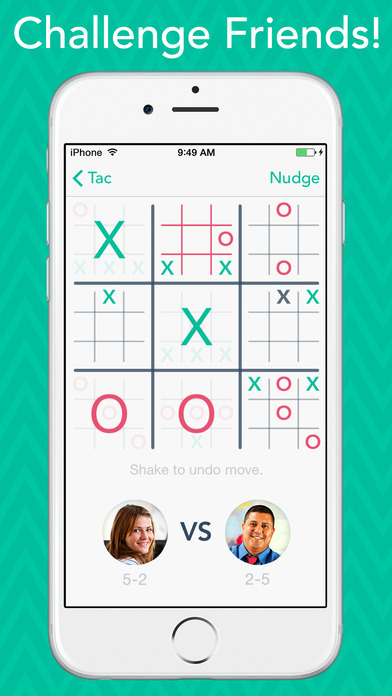 Welcome to TAC—the new concept of Tic-tac-toe!